“Please Hold” is what the market appears to be telling us right now. Wednesday sure looks like a “Test for Supply” and it didn’t find much. Note on the chart below (3 bars back) the long tail below both support and channel lines, only to close near the top. Volume was about average, but look how volume dried up the following two days. Sure looks like a potential to move higher. Sentiment remains negative. The bigger question is do we move right back up to the upper channel line only to fall back again? Hard to tell right now but this structure is looking more and more like re-accumulation. OK lazy, but re-accumulation none the less. I’ve been out to the office for the past 4 weeks chris-crossing the coasts. It’s good to be back so I can spend more time on some research (and commentary?). I need to get back to Wyckoff labeling too. So, sorry that this post is late as I typically try to get something out over the weekend. I’d like to Thank my hosts in New York, Seattle and San Francisco for their generous hospitality this past month. Let’s take a quick look at where the strength is in this market. The pie chart & table below should give you some idea of that. The next question is will the previous sector leaders (biotech, healthcare & consumer discretionary) resume the lead? So far I don’t see it, but it’s early yet. This is important because we need to get a handle on whether money is rotating out of these sectors and into others (like energy perhaps). We need to keep an eye on this as previous leaders would be in Distribution structures and new leaders would be in Accumulation structures. Where the “smart money” is going (or staying) is a key factor in stock section. That’s it for now. I’ll try and post more info. next weekend and be more punctual. Have a good week. 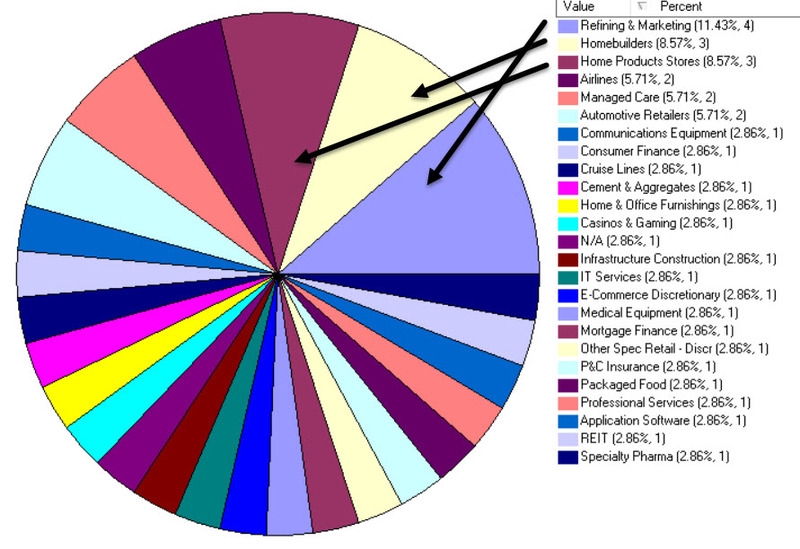 …….. Tom ……..
bar chart by MetaStock; pie chart by http://www.HighGrowthStock.com; used with permission.